About the Author: Shivam Bhalla is pursuing B.Tech in Mechanical Engineering from BITS Pilani. 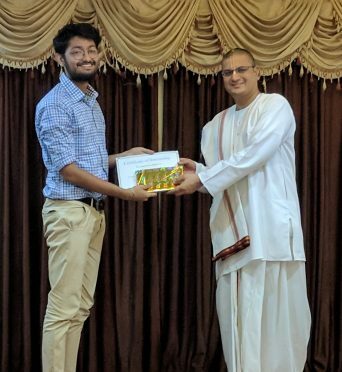 He shares his internship experience at Akshaya Patra – loaded with coding and yummy food. Reluctant to spend my vacations at home, I applied to the best internship offered by the college placement cell which was at Akshaya Patra in Jaipur. I had to get through a telephonic interview to join the organization. The interviewer asked me for a brief introduction including my likings, the clubs I was a part of, etc. I initiated with my field of study and told him about my interest in coding, extracurricular activities, and my problem-solving skills. I also mentioned that I wanted to be an entrepreneur. He questioned me about my interest in the internship and my expectations from it. I told him that I wanted to be a part of the organization and grow on a personal and professional front. We talked about my strengths and weaknesses, my hard working and encouraging attitude, leadership skills, and willingness to learn. He also asked me questions like which is more important to complete a task – talent or hard work. I answered that discipline is more important than these two and gave a satisfactory justification. After being questioned on my programming skills which included C and web development, I was hired. Loaded with excitement, I reached Akshaya Patra and was escorted to the dormitory where I was to stay with 16 other interns. All set for our first day, we walked into a class wherein the food and quality in charge, Mr. Divya, formed groups of students, and each group was assigned a project and a mentor to report to. Akshaya Patra runs lunch programs for government schools and economically backward people along with Anganwadi feeding. This required preparation of food on a very large scale. I was assigned a project on Raw Material Price Optimization which required me to build a comparison website to help the team optimize the prices of raw materials. For a better design of the website, I took online lectures on web development which helped me refine my concepts. I included the prices of the raw materials in the mandi(market) and online sites, and the price which our organisation paid for the latest purchase so that we could procure the materials at the best rate. I named the website ‘Pricemania’. Other projects included finding a material which could provide better insulation for food packaging to minimise heat loss during delivery and designing a stirrer to prevent vegetables from settling at the bottom of a container. We attended personality development classes and seminars by renowned personalities every day. Mr. Divya introduced us to various terms used in industries viz. Kaizan and helped us understand the essentials of staying and moving into industries. He slipped in some tricks from time to time, motivated us, and helped us improve. We also visited some industries and learnt how they operated. We had frequent tours to the mega kitchen at the organization and enjoyed the lip-smacking dishes. Every Sunday, we had recreational tours in Jaipur which felt immensely refreshing. We were acquainted with spiritual aspects of life by devotees known as Prabhu. I understood the significance of a proper work environment and recreational activities. On the last day, we made a presentation on our respective projects and how we achieved our goals. We explained the working of the website and how it would benefit the organization. As the day ended, we were treated to a feast and awarded certificates and prizes. The experience was a complete roller-coaster ride. From learning programming skills to tackling new problems and learning to appreciate myself, I had the best time of my life interning there. Feeling amazed by Shivam’s journey? Check out these programming internships and unleash the coder in you. Editor’s note – If you also have an interesting story to share, you can now participate in Your Internship Story Contest 2017 and win cash prizes and goodies worth INR 1 Lac!